H2O: Do You Drink Enough? You hear it all the time from, “you should drink more water,” to “eight glasses a day!” but do you actually drink enough water? You should! Heck, it kind of is us. “Water makes up about two thirds of who we are, and influences 100 percent of the processes in our body,”says CamelBak hydration expert Doug Casa, PhD. In a most basic sense your body craves it, needs it and will benefit from it. Right here, right now make a conscious effort to fuel your body with the water it needs to thrive. 1. Aids Weight Loss: If you are looking to lose some lbs. up your water intake! It’s not uncommon to pack on some extra pounds mistaking thirst for hunger so, the next time you think you are hungry, reach for a glass of water instead it may be just what your body needed. H2O is also a great replacement for high-calorie drinks like soda and alcohol ’cause really who needs all that extra sugar, carbs and fat anyway!? 2. Energy Boost: Being dehydrated can zap your energy and make you feel tired and sluggish. The next time you’re feeling sleepy (when you shouldn’t be) reach for some H20 to refresh and re-energize your mind and body. 3. Natural Headache Cure: Often when we have headaches it’s simply a matter of not drinking enough water. Going without water for too long causes headaches for some people, and has been identified as a migraine trigger. Your headache Rx: Try drinking two to four cups of water for headache relief within one to two hours. 4. Healthier Skin, Hair and Nails: Drinking water can clear up your skin and help you get that fresh glow look going on! Commit to drinking a healthy amount of water over a week and see the effects it has on your skin, hair and nails. 5. Keeps Things Moving Digestive-Wise: Our digestive system needs a good amount of water to properly digest our food. Often water can help cure stomach acid problems and along with fiber it can cure constipation. 6. Scrub Brush For Your Kidney’s: Your kidney’s remove waste from your body but they can’t do it alone! Water is used by the body to flush out all of those toxins so, the more water you drink the better your kidneys will function! 7. Better Exercise: We all know it is essential to drink water when exercising, but did you know being dehydrated can negatively impact your workouts? That’s right dehydration will slow you down and make your workouts harder. Be sure to drink water two hours before you plan to exercise, and of course during and after. 8. Mood Booster: The next time you’re feeling irritable, grumpy or down in the dumps reach for a glass of H2O: Drinking water can refresh you so much, it can actually improve your state of mind. Don’t let dehydration get you down, drink water to clear your mind! So, now that you know how water really does make you AWESOME let’s see if you are getting enough. The best way to determine if you are getting enough water is to take a peek at your pee! Yeah, you heard me! Remember, our bodies are about two thirds water… so, if your pee is bright-dark yellow you need to drink more, if your pee is clear to light straw-colored you’re a-okay. As for how much water you should drink each day well, that’s a simple question with no easy answers. Studies have produced varying recommendations over the years, but in truth, your water needs depend on many factors, including your health, how active you are and where you live. Although no single formula suits everyone, knowing more about your body’s need for fluids will help you estimate how much water you should drink each day. Try this hydration calculator from CamelBak to help you determine your water intake needs. 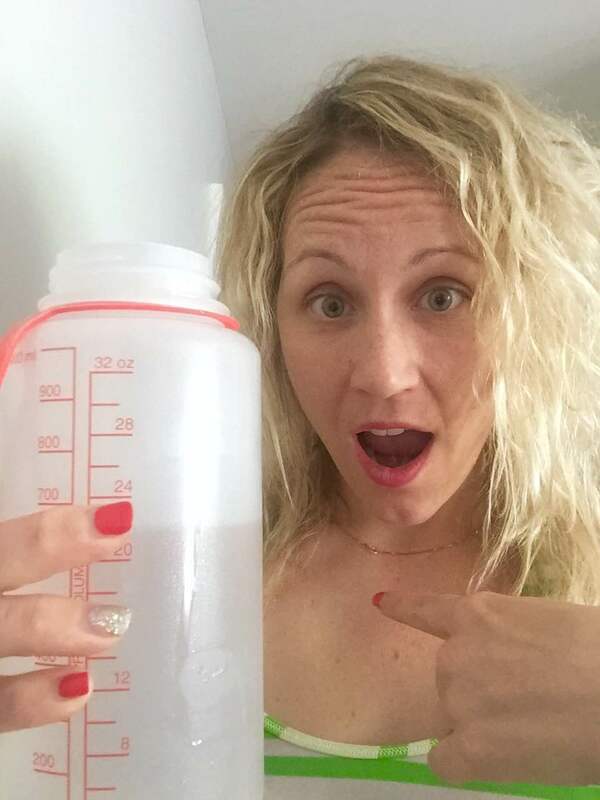 Also, the “8×8” rule (eight 8-ounce glasses of water a day) isn’t supported by hard evidence, but it’s easy to remember and is a good start towards determining how much water your body needs! Raise your glass and make water a daily habit for better health! Posted on July 30, 2015 October 31, 2017 by Table Without BordersPosted in HealthTagged CamelBak, cleanse, dehydration, digestion, Doug Casa, eight glasses water, energy boost, exercise, fitness, flavored water, h20, heachaches, Healthy, how much water to drink, hydrate, juice, kidneys, lemon water, michelle swift, migraine, mood, pop, quit soda, scrub brush, She Does Fitness, toxins, water, weight loss. Water is absolutely key to hydration and staying in balance. Our industry is helping people meet their hydration needs, by offering a wide variety of beverages, including bottled water. Whether spring, purified, mineral, artesian or sparkling, bottled water provides people with a choice that is both convenient and portable. With that said, other beverages, such as 100 percent juice, sports drinks, soft drinks, and more come in an array of calorie counts and sizes and can be integrated into a healthy diet as well.